There's nothing like a summer job when you're 15 years old. Whether it's busing tables or janitorial work, the labor sculpts your ego and turns you into an adult. One teen's learning that lesson right now. 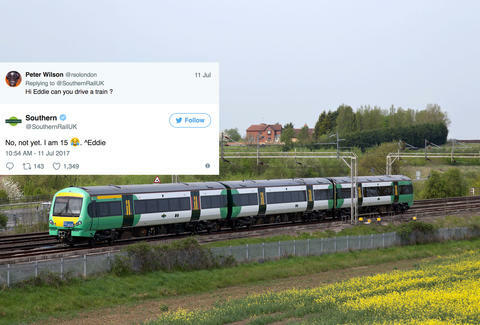 His name is Eddie, he's doing experience at the United Kingdom's Southern Railway, and remarkably, he's been given the keys to the company's Twitter. But what began as a very simple call for questions and feedback -- something the rail company takes on Twitter often -- has spiraled into a hilarious string of jokes and trolly shenanigans. Tweeters have sent him ridiculous questions and joked that he's probably the CEO in disguise. Eddie, for his part, has gamely joined in on the fun, tweeting pithy ripostes back at them as quickly as he could. "I just tried to be myself and everything just turned out as it has," he later told Scott Mills of BBC Radio 1. Eddie took a break and allowed someone else to take the reins on the replies from the account, but has since returned, meaning -- hopefully -- the hashtag #AskEddie will be something Southern's customers and the rest of Twitter can enjoy for the foreseeable future, or at least until Eddie goes back to school. Here are some of the funniest questions he received and his replies. Overall, the Twitter reception to Eddie was overwhelmingly positive. Folks couldn't get enough of him, and now they clamor for his return. Here's hoping Southern Rail treats this young employee right and that Eddie finds plenty of success staying true to his diplomatically jocular ways.